A postcard collector from Scranton, Pa. has discovered a missing Lincoln monument. Historians say the postcard, and other documents, confirm that a 16-foot monument to Abraham Lincoln once stood in Nay Aug Park in Scranton. 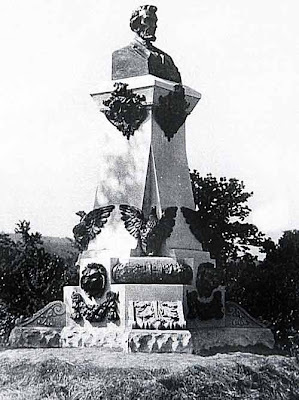 Dedicated with great fanfare on July 4,1909, the centennial year of Lincoln's birth, the 16-foot-tall monument has simply vanished. The 1909 postcard depicts an ornate stone pillar complete with bronze eagles and lions and topped by an enormous bronze bust of the nation's 16th president. At the bottom of the card are the words: "Lincoln Monument, Nay Aug Park." "It's just depressing," said Mary Ann Moran-Savakinus, executive director of the Lackawanna County Historical Society. "It's very unfortunate that it's not documented somewhere. Things like that just don't disappear." Can any Building Collector readers shed light on this mystery? Anyone have a souvenir archiectural replica of this monment?